International Journal of Research in Health Sciences,2014,2,1,153-161. 1,3,4Assistant Professor, 2Professor, 5Junior Resident, Department of Radiodiagnosis, SRMS Institute of Medical Sciences, Bareilly, U.P., INDIA. Introduction: The superficial location of the scrotal contents makes them ideally suited for sonographic examination. The development of high-frequency, real-time scanners along with color Doppler have enhanced the diagnostic accuracy of scrotal sonographic examinations. Sonography played a vital role in the evaluation of testes obscured from palpation by large hydrocele and accurately separated intra testicular from extra testicular masses, even when the location is equivocal on physical examination. Materials and Methods: A prospective study of 108 patients who presented with complaints of scrotal pathology. Gray scale sonography and color Doppler examination was carried out with linear array high frequency (6-7-9 MHz) for evaluation of patients. During ultrasound scan, on a routine basis patient history, clinical examination were evaluated. Observations were collected in a prescribed Performa for analysis. Results: Out of 108 cases, 19 had pathologies bilaterally and 89 had unilateral involvement. Inflammatory /infective pathologies were noted in largest number of cases – 56 cases (51.8%), followed by Inguino scrotal hernias – 13 cases (12%), congenital and infertility related pathologies in – 09 cases (8.3%) each, neoplastic lesions in – 07 cases (6.4%). Miscellaneous conditions like trauma, torsion and epididymal cyst were noted in 14 cases (12.9%). 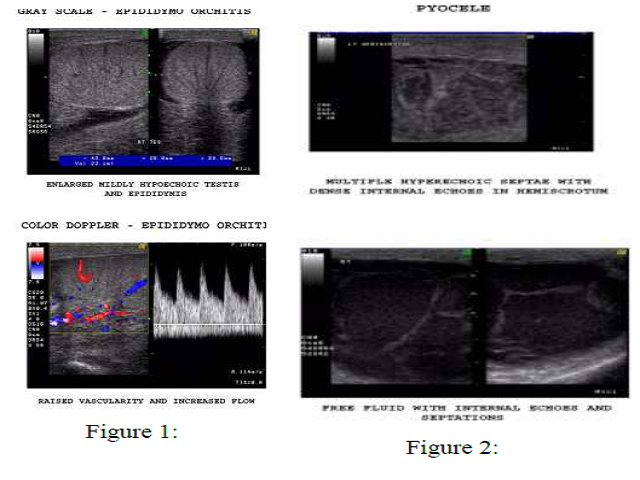 Conclusion: High frequency ultrasonography with color Doppler is highly accurate and sensitive primary imaging modality for investigation of scrotal pathology in appropriate clinical setting, with adequate history and physical examination.